Today Microsoft took the wraps off a brand new Surface Pro - just don't call it the Surface Pro 5. Considering the Surface Pro 4 launched way back in October 2015, an updated model was long overdue, and we've got all you need to know about what's new. 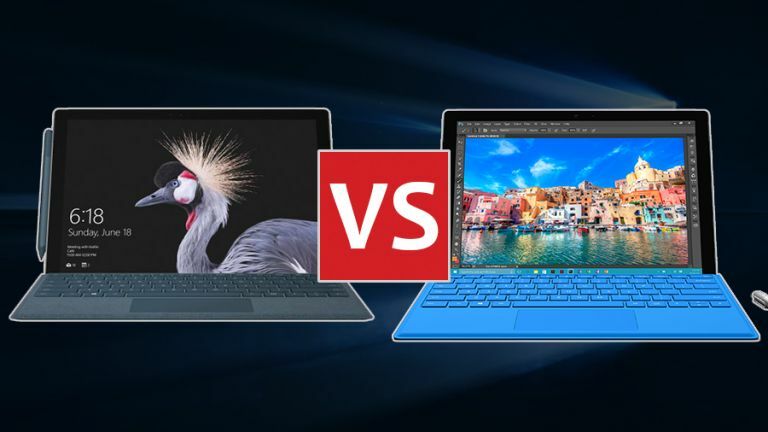 From internal components to external looks, here's how the two different models stack up against each other, whether you're thinking about upgrading from a device you've already got or you're considering jumping into the world of the Surface Pro for the first time. All the images below are of the new 2017 Surface Pro. Stare closely at the new Surface Pro (above) next to the Surface Pro 4 and you won't notice too many external changes: the kickstand hinge mechanism has been upgraded, however, Studio-style, so you can lay the tablet flat and use it with the Surface Pen (sold separately, as with the Surface Pro 4). Microsoft's press materials say it's the lightest Surface Pro ever but dig down into the specs and this seems to be the same weight as its predecessor - 7.66 grams (1.69 pounds) for the m3 version and 786 grams (1.73 lbs) for the i5 and i7 editions. Either the sums are wrong or something has been copied and pasted from one press release to another, and if we eventually make sense of it all we'll report back. The new model seems to be a shade thicker (8.5 mm vs 8.45 mm) but the length and width of the main unit are the same, as is the 12.3-inch, 2736 x 1824 pixel display. One difference we are sure about is that the i5 model in the new Surface Pro range is now fanless, as well as the m3 model. Microsoft says all three editions (m3, i5 and i7) are quieter overall. The physical and aesthetic differences between the new Surface Pro and the Surface Pro 4 might be hard to spot, if they're there at all, but the internal changes are much more obvious. We're primarily talking about the CPU upgrades, which mean the new devices are significantly faster and run cooler than ever before. The processors may have the same m3, i5 and i7 labels, but the technology inside the new devices uses the seventh-generation Kaby Lake architecture from Intel rather than the sixth-generation Skylake versions. Without going into too much detail about the ins and outs of CPU technology, that means better performance with less of a power draw, perfect for working on the go. Microsoft says you can expect about a 20 percent performance increase overall compared with the Surface Pro 4. Both the Surface Pro 4 and the new Surface Pro can be configured with 4GB, 8GB or 16GB of RAM, while SSD storage starts at 128GB in both cases. On the old Surface Pro 4 that tops out at 512GB, but the new Surface Pro offers a 1TB option if you've got the cash for it. Besides the looks and the specs there are quite a few other features to talk about. Most Surface Pro 4 models came with a Surface Pen in the box for example, but this is now a definitive optional extra for the new Surface Pro so budget accordingly. Neither the 2015 or the 2017 edition include the Surface Keyboard, so that's another accessory you need. Speaking of the Surface Pen, Microsoft says the newly updated 2017 incarnation offers 4096 levels of pressure, up from 1024 last time around - so if you're the creative sort, your digital doodlings can be even more sensitive to your touch. The new Surface Pro is also compatible with the Surface Dial, unlike its predecessor. Battery life is key on a device like this, and Microsoft is promising you can eke out around 13.5 hours from the new Surface Pro, a 50 percent improvement over the device that came before (we'll reserve judgement until we've given it a test). Finally, an LTE/4G version of the new Surface Pro is on the way later this year, Microsoft has confirmed, another significant upgrade over the Surface Pro 4. With prices ranging from £799 to an eye-watering £2,699 ($799 and $2,699 in the US), there's no doubt the new Surface Pro (5) is an impressive bit of kit. It might look and feel the same as the Surface Pro 4, but it's going to run faster and cooler for longer, and comes with upgraded accessories as well. The only slight negative is the hefty price, especially at the higher configurations, which might leave shoppers falling back on the Surface Laptop instead. If you want a laptop that can turn into a tablet, well then you'll have to pay a premium. The Surface Pro 4 can still be bought from Microsoft in various configurations, though we're not sure how much longer they're going to hang around - at the time of writing prices started at £674.10 in the UK and $699 in the US. Considering the internal components are now two years old, we'd say you'd have to get a more competitive price on a Surface Pro 4 before it would be better value than the new models.